The nutty parmesan and savory spice blend recipes are from the nutritionfacts.org site. Warm the butter in a medium saucepan over medium heat, add the chopped asparagus and sliced mushroom and saute until cooked. About 3-4 minutes. Mix all the spices together in a small food processor. Combine all ingredients in a small food processor and mix well. Do not over mix. Transfer to a jar with a tight fitting lid. The nutty parm can be stored for a few months and used to top various dishes. 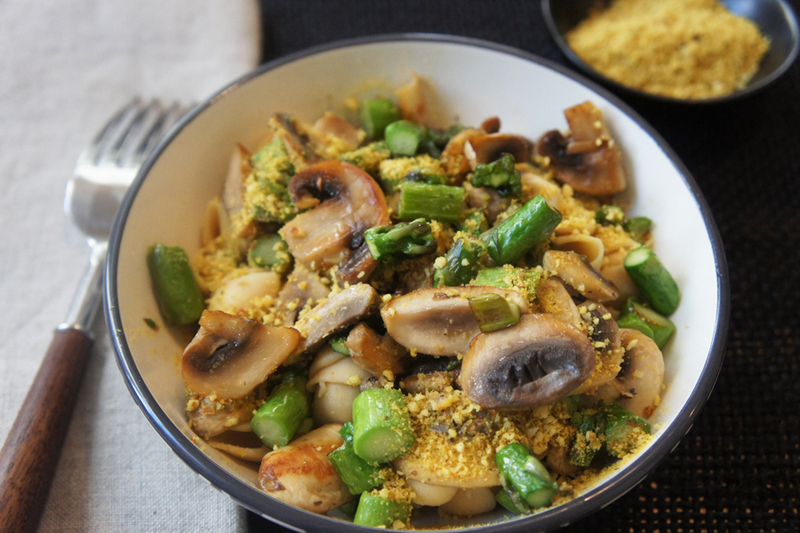 Place the cooked pasta in a bowl top with sautéed mushrooms, asparagus and nutty parmesan.